In this research, the effect of maternal diabetes on the choroids plexus volume changes and total length of capillaries in (15°, 1-day-old and 30-day-old) rat neonates was studied. Diabetes was induced by streptozotocin (60 mg kg-1), given by a single intraperitoneal injection to female Wistar rats (250-300 g). Control animals were given an equivalent amount of citrate buffer saline. In three stage of life, the volume of choroids plexus and total length of capillaries by stereological methods was measured. Statistical analysis`s showed significant difference in choroids plexus volume and total length of capillary`s between diabetic and control groups (p<0.01). This study shows that maternal diabetes causes microvascular disorders in choroids plexus system that lead to an increase in volumes of that. Diabetes is a complex metabolic syndrome that increases the risk for vascular dementia and stroke (Arvanitakis et al., 2005). Cerebral microvascular diseases in diabetes has been attributed to the effects of chronic hyperglycemia on capillary structure, endothelial reactivity and blood-brain barrier permeability, thus affecting regional metabolism and blood flow regulation(Novak et al., 2006). Major congenital malformations, including those affecting the cardiovascular system, remain the leading cause of mortality and morbidity in infants of diabetic mothers (Pinter et al., 2001). Diabetes angiopathy is characterized by the vessel wall remodeling, media hypertrophy and increased stiffness, that may be enhanced by circulating vasoconstrictors and vascular inflammation (Bhutto and Amemiya, 2002). Diabetes alters the glucose and insulin transfer across the blood-brain-barrier, thus affecting regional metabolism and microcirculation. Chronic hyperglycemia, which further alters membrane permeability and decreases regional blood flow, may lead to permanent cell damage. Therefore, diabetes seems to be associated with progressive metabolic disturbance in the cerebrovascular bed that may affect blood flow and accelerate the white matter degeneration (Tomassoni et al., 2004). Offspring of diabetic mothers (both humans and experimental) experience a two-to fourfold increase in congenital anomalies (Lim et al., 2004). Although no particular organ system or tissue seems to be specifically targeted a variety of cardiovascular anomalies are frequently observed (Lenz et al., 2003), arrested development or maldevelopment of this vasculature would lead to fetal demise early resulting in the termination of pregnancy: whereas arrest and/or maldevelopment of vasculature(s) at later times, associated with specific organ or tissue development, would contribute to congenital abnormalities in a wide variety of organs and tissues (Pinter et al., 2001). Several lines of evidence indicate that chronic hyperglycemia is the major cause of vascular endothelial cell injury and that survival/repair mechanisms for vascular cell injury are activated in the early stages of the disease (Sabbatini et al., 2001). Congenital defects known to be associated with uncontrolled diabetes mellitus are numerous and varied. Several theories have been postulated regarding potential mechanisms by which maternal diabetes might induce dymorphogenesis: how ever the pathogenesis remains unknown (Pinter et al., 2001). This study was aimed at investigating the changes in the choroids plexus capillaries in the (embryo, neonate and adult rats) from diabetic and normal mothers. For this aim we estimate the volume of choroids plexus and total length of capillaries in rats from diabetic mothers to control in three stage: embryonic (15.5°), neonatal (1-day-old) and adulthood (30-day-old) stage. The experiment was conducted in Faculty of Science, Islamic Azad University of Mashhad, Iran (2007). In this study Wistar rats (300-350 g) prepared from Razi Institute were maintained at 22 °C with 12 h periods of light and darkness and normal humidity over night. They were kept in mating cages then next day, vaginal plug was checked. Appearance of vaginal plug was positive sign for day (0) of gestation. Pregnant rats were maintained at standard condition. 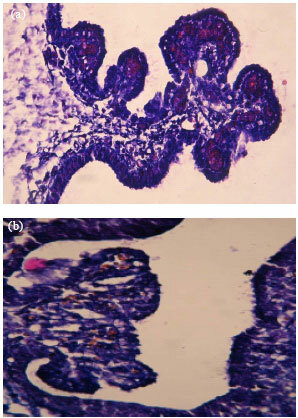 For assessment of maternal diabetes effects on choroids plexus volume and total length of capillaries in long time, at 1st days of gestation pregnant rats were injected with single dose of streptozotocin (60 mg kg-1) intraperitonealy (Khan et al., 2004). Control group was injected with sodium citrate (PBS). At 3rd days of gestation, blood was sampled from reticular tissue through eye corner for blood glucose measurement. Those rats which had less than 400 mg dc-1 glucose blood were discarded from the process, but others were maintained for labor time. At the 15th day of gestation, 1st and 30th day after birth, we select embryo and infant of each diabetic and normal mother. All embryos and infants were anesthetized with sodium pentobarbital (64.8 mg kg-1) and decapitated. The brain were rapidly removed and fixed in 10% paraformaldehyde. NaCl was added to the fixative to make the tissue float in order to overcome deformities during the fixation period. 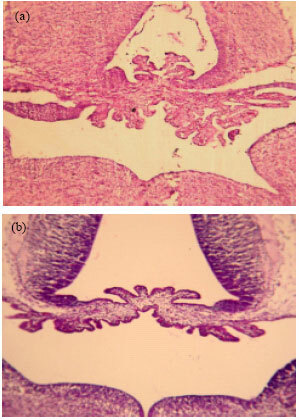 Paraffin embedded tissue blocks were sectioned at 7 mμ thickness coronally and stained with haematoxylin-eosin. In addition, tissue blocks containing samples (brains) were serially cut throughout. Form several hundred sections per block, of each 20 section 3 serial sections were obtained. For example for the first series: 31°, 32°, 33° section and for the second series: 54°, 55°, 56° section and so on. Therefore it is mounted every 3 section on a slide. At a practical level, Stereological methods are precise tools for obtaining quantitative information about three-dimensional structures based mainly on observations made on sections. The volume of the choroids plexus were measured with Cavalieri method (Gunderson et al., 1988). All experiments were performed a minimum of two times. Student`s t-test was used for comparison when only 2 groups were analyzed. Statistical significance was chosen as p<0.05. All results are reported as Mean ± SEM. Diabetes was assessed in this study by monitoring blood glucose levels of both PBS and STZ-injected rats. There was a significant increase (p<0.001) in blood glucose levels, from 100 ± 5 mg dL-1 in control to 470 ± 18 mg dL-1 in diabetic rats. Choroids plexus volume and total length of capillaries in embryo: It was observed that the appearance of Choroids plexus in embryos from diabetic mothers is very different from control and there was more progressive in experimental groups (Fig. 1). There was a marked increase in the volume of Choroids plexus in 15.5 embryos from diabetic mother in compare with control (Fig. 2). This increase was 0.29 ± 0.002 mm3 in control to 0.74 ± 0.009 mm3 in embryo from diabetic mother (p<0.001). Statistical analysis was shown a significant increase (p<0.001) in total length of capillaries in embryo from diabetic mother 765 ± 87.8 mm to control 132.5 ± 13.6 mm (Fig. 3). Choroids plexus volume and total length of capillaries in neonate (1 day old rat): There were some changes in Choroids plexus structure in neonate form diabetic mothers that made it abnormal (Fig. 4). The volume of Choroids plexus in neonate from diabetic mothers was 0.556 ± 0.036 3 to 0.314 ± 0.027 mm3 in control (p<0.001) (Fig. 5). Statistical analysis was shown a significant increase in total length of capillaries in neonate (Fig. 6) from diabetic mothers 5068 ± 430 mm to control 1974 ± 228 mm (p<0.001). In 400X, It was observed that the number of choroids plexus capillary`s surface in neonate from diabetic mothers increased obviously (Fig. 7). Choroids plexus volume and total length of capillaries in (30-day-old rat): Choroids plexus volume has had a significant increase (p<0.001) in 30-day-old rats from diabetic mothers 0.556 ± 0.036 mm3 as compared with controls 0.314 ± 0.027 mm3 (Fig. 8). The total length of capillaries in 30-day-old rats from diabetic mothers was 3111 ± 181 to 1389 ± 154 mm in control (Fig. 9). present data implicate raised blood glucose (among the clinical and metabolic variables) is the most important factor that proliferate the choroids plexus capillaries. Maternal diabetes makes some changes in choroids plexus appearance in embryonic stage (Fig. 1). In addition in hyperglycemic condition in embryo choroids plexus progress much more than normal condition. The appearance of choroids plexus in neonates is corporate with some disruption that look like angiogenes (Fig. 4). It is demonstrated that the volume of choroids plexus in embryos from diabetic mothers have show a meaningful (p<0.001) increase camper to control in (Fig. 2). Also this meaningful increase has seen in neonatal and adulthood stages in experimental groups (Fig. 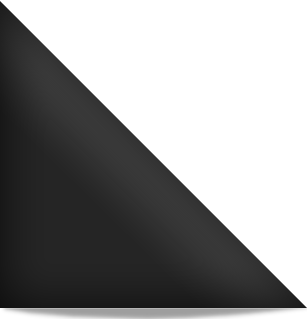 5, 8). In addition the total length of capillaries have remarkable increase (p<0.001) in all stages of experiment (embryonic, neonatal and adulthood) (Fig. 3, 6, 9). It is postulated that a kind of angiogenesis process happen when blood glucose raised. Considerable experimental evidence inculpates Vascular Endothelial Growth Factor (VEGF) as one of the candidate factors providing a mechanistic link between hyperglycemia and diabetic complications (Madri et al., 2003). Presence of hyperglycemia and/or insulin deficiency in children with new-onset of diabetes is associated with plasma VEGF elevation, even at the outset of disease and this can be mitigated by insulin therapy (Ashraf et al., 2005). It is the primary determinant of circulation VEGF and Ang-2 levels (Malamitsi-Puchner et al., 2000). Raised blood glucose in diabetes exerts toxic effects on the endothelium through a number of mechanisms by increasing substrate flux through the sorbitol pathway, elevated blood glucose can induce a hyperglycemic pseudo-hypoxic state may induce VEGF production (Lim et al., 2004). The accelerated formation and accumulation of glycotion products associated with raised blood glucose may also up regulate VEGF and Ang-2 mRNA in vitro (Stitt et al., 2005). Experimental studies suggest that VEGF may stimulate the expression of adhesion molecules by endothelial cells and promote vascular inflammation (Rodrigues et al., 2004). Intensive multi factorial intervention is associated with significantly improved cardiovascular outcome (Loukovaara et al., 2005). Present findings are consistent with these clinical observations and it is tempting to speculate that improvements in cardiovascular outcomes may be related to reductions in these angiogenic growth factors and associated improvement in endothelial abnormalities (Lassus et al., 2003). In other report demonstrate that hyperglycemic insults in reduced levels of VEGF- A which in turn, leads to abnormal VEGFR signaling, resulting in embryonic vasculopathy (Rodrigues et al., 2007). These finding and our observation that addition of exogenous VEGF- A blunts the hyperglycemia-induced vasculopathy may ultimately lead to novel therapeutic approaches for the prevention and treatment of congenital abnormalities associated with diabetes (Pinter et al., 2001). Vascular endothelial growth factor (VEGF) and the angiopoietins are two families of growth factors believed to act predominant on vascular endothelial cells. VEGF is mitogenic for endothelial cells, acting early and at most points in the angiogenic cascade (Lim et al., 2004). In creasing evidence suggests a role for VEGF I the pathophysiology of cardiovascular disease. Elevated plasma VEGF has been shown in patients with hypertension and diabetes with levels correlating with measures of endothelial damage/dysfunction and overall cardiovascular risk in hypertensive patients(s) (Ferrara, 2001). There is accumulating evidence that enhanced formation of Advanced Glycation End products (AGEs) and activation of AGF receptors in the diabetic state may contribute to impaired angiogenic potential (Stitt et al., 2005). Recently discovered vasoconstrictors and angiogenesis regulators such as endothelin (ET) an vascular endothelial growth factor (VEGF) have been intensely studied for possible pathogenic roles in diabetic vascular complications(Kakizawa et al., 2004). Thus , poor glycemic control causes increased levels of plasma VEGF, which may result in hypertension and vascular complications in diabetes. Short term treatment resulting in good glycemic control can improve levels of VEGF and may provide beneficial effects on diabetic vascular complication (lim et al., 2004). New findings indicate that the commen pathophysiologic mechanism linking chronic hyperglycemia to vascular pathology in diabetes is the mitochondrial overproduction of Reactive Oxygen Species (ROS) leading to the increased formation of AGEs, activation of protein kinase C, activation of the aldose reductase and deliberation of active nuclear factor kB-mechanisms that have been correlated with the pathogenesis of diabetic microangiopathy (Sabbatini et al., 2001). Others have suggested that maternal diabetes may also have lasting adverse consequences on cardiovascular function of the next generation, particular because offspring of diabetic pregnant rats demonstrate overt insulin resistance in adulthood (Khan et al., 2004). Further investigation is needed to clarify the mechanisms involved and lead t a new understanding of the importance of nutrition during pregnancy. This will provide an important approach to the primary prevention of diabetes and chronic degenerative diseases (Madazli et al., 2008). understanding the causes of diabetic vascular complications has become an increasingly important issue because of the rapid rising prevalence of diabetes. Present study highlights the importance of the cross-talk between maternal hyperglycemia and proliferation of choroids plexus capillary`s in all stages of newborn`s life. May be a kind of angiogenesis process will be take place that proliferate the capillaries and increase the choroids plexus volume. It opens new insights into necessary of treatment the raised blood glucose in pregnant women. Ashraf, A., G. Mick, S. Meleth, H. Abdullatif and X. Wang et al., 2005. Effect of insulin on plasma vascular endothelial growth factor in children with new-onset diabetes. J. Clin. Endocrinol. Metab., 90: 4920-4923. Bhutto, I.A. and T. Amemiya, 2000. Choroidal vasculature changes in spontaneously hypertensive rats - transmission electron microscopy and scanning electron microscopy with casts. Ophthalmic. Res., 34: 54-62. Ferrara, N., 2001. Role of vascular endothelial growth factor in regulation of physiological angiogenesis. Am. J. Physiol. Cell. Physiol., 280: C1358-C1366. Gundersen, H.J.G., T.F. Bendtsen, L. Korbo, N. Marcussen and A. M�ller et al, 1988. Some new, simple and efficient stereological methods and their use in pathological research and diagnosis. APMIS., 96: 379-394. Kakizawa, H., M. Itoh, Y. Itoh, S. Imamura and Y. Ishiwata et al., 2004. The relationship between glycemic control and plasma vascular endothelial growth factor and endothelin-1 concentration in diabetic patients. Metabolism, 53: 550-555. Khan, I., V. Dekou, M. Hanson, L. Poston and P. Taylor, 2004. Predictive adaptive responses to maternal high-fat diet prevent endothelial dysfunction but not hypertension in adult rat offspring. Circulation, 110: 1097-1102. Lassus, P., K. Teramo, I. Nupponen, H. Markkanen, K. Cederqvist and S. Andersson, 2003. Vascular endothelial growth factor and angiogenin levels during fetal development and in maternal diabetes. Biol. Neonate., 84: 287-292. Lenz, T., T. Haak, J. Malek, H.J. Gröne, H. Geiger and J. Gossmann, 2003. Vascular endothelial growth factor in diabetic nephropathy. Kidney Blood Press. Res., 26: 338-343. Lim, H.S., A.D. Blann, A.Y. Chong, B. Freestone and G.Y. Lip, 2004. Plasma vascular endothelial growth factor, angiopoietin-1, and angiopoietin-2 in diabetes: Implications for cardiovascular risk and effects of multifactorial intervention. Diabetes Care., 27: 2918-2924. Loukovaara, M., P. Leinonen, K. Teramo and S. Andersson, 2005. Concentration of cord serum placenta growth factor in normal and diabetic pregnancies. BJOG., 112: 75-79. Madazli, R., A. Tuten, Z. Calay, H. Uzun, S. Uludag and V. Ocak, 2008. The incidence of placental abnormalities, maternal and cord plasma malondialdehyde and vascular endothelial growth factor levels in women with gestational diabetes mellitus and nondiabetic controls. Gynecol Obstet Invest., 65: 227-232. Madri, J.A., J. Enciso and E. Pinter, 2003. Maternal diabetes: Effects on embryonic vascular development-a vascular endothelial growth factor-A-mediated process. Pediatr. Dev. Pathol., 6: 334-341. Malamitsi-Puchner, A., J. Tziotis, E. Protonotariou, A. Sarandakou and G. Creatsas, 2000. Angiogenic factors in the perinatal period: diversity in biological functions reflected in their serum concentrations soon after birth. Ann. N. Y. Acad. Sci., 900: 169-173. Novak, V., D. Last, D.C. Alsop, A.M. Abduljalil, K. Hu, L. Lepicovsky, J. Cavallerano and L.A. Lipsitz, 2006. Cerebral blood flow velocity and periventricular white matter hyperintensities in type 2 diabetes. Diabetes Care., 29: 1529-1534. Pinter, E., J. Haigh, A. Nagy and J.A. Madri, 2001. Hyperglycemia-induced vasculopathy in the murine conceptus is mediated via reductions of VEGF-A expression and VEGF receptor activation. Am. J. Pathol., 158: 1199-1206. Rodrigues, A.C., S.A. Schellini, C.T Spadela, E.A. Gregório and C.R. Padovani, 2007. Choroidal vessels alterations in treated and untreated diabetic rats. Arq Bras Oftalmol., 70: 433-440. Rodrigues, A.C., S.A. Schellini, E.A. Gregório, C.T. Spadella and C.R. Padovani, 2004. Choroidal vasculature in diabetic rats. J. Submicrosc. Cytol. Pathol., 36: 327-331. Sabbatini, M., P. Strocchi, L. Vitaioli and F. Amenta, 2001. Microanatomical changes of intracerebral arteries in spontaneously hypertensive rats: A model of cerebrovascular disease of the elderly. Mech. Ageing Dev., 122: 1257-1268. Tomassoni, D., G. Bellagamba, D. Postacchini, D. Venarucci and F. Amenta, 2004. Cerebrovascular and brain microanatomy in spontaneously hypertensive rats with streptozotocin-induced diabetes. Clin. Exp. Hypertens., 26: 305-321.